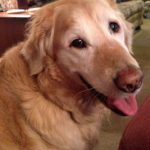 In the dog world, it’s important to practice new behaviors without distractions and slowly introduce new noises, smells, and sights—that all makes perfect senses in theory. But, how do you train your dog to walk on a leash inside when you really need a loose leash outside? It is all about foundation and setting expectations. You may need a few extra treats in the beginning stages, but it is easier to phase out food rewards than to fix naughty behaviors that have occurred for months, even years. Before you take your training to the sidewalk, practice your “sit” and “wait” inside. It’s easier to keep your dog’s attention than to get it back once distracted. If you then set the expectation that waiting at the door earns outside time, your dog starts the walk in a much calmer state before squirrels, bikes, and running children distract him. Once outside, have some amazing treats handy and simply reward if your dog if there’s slack in the leash. Again, you are rewarding for good behavior in a highly distracting environment and making sure your dog knows to listen to you no matter what is going on. After you have made sure your dog’s attention is on you, take a few steps while you say “let’s go”. Only a few and be sure to reward while walking. Many people are hesitant to take treats outside because it is inconvenient and worry that neighbors might see them training. It is more embarrassing to have a dog who pulls you through flowerbeds or completely learns to tune you out because the outside world is more rewarding. 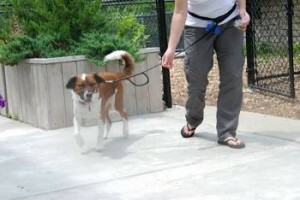 Leash walking is hard work for your dog and it definitely does not come naturally for many people. Make it easy on yourself in the beginning stages and simply focus on rewarding for a few steps at a time. The less motion you get, the easier it is to keep your dog’s attention on you. And, you figure out what the heck you are doing so you can effectively communicate to your dog. After you have worked on that, you can start adding more steps to your walk. Do stop on occasion for a quick play break on leash. I like to bounce a ball for energetic dogs after a few minutes so I reward good leash behavior with a little play session. If you don’t, your dog may jump, bite the leash, bark or other troublesome behaviors out of frustration. The more practice you get, the easier it becomes. Long, relaxing walks with your dog are the grandest reward of all.